With my knitting obsessions going full force, the date got away from me and I almost missed Valentine's Day. Well, I probably wouldn't have missed it all together, but I almost forgot to make some Valentines. I remember decorating a shoe box to put on my desk or an envelope to hang off the side in elementary school for all the Valentines I would receive from my classmates. Too bad we can't do the same thing as adults. Wouldn't that be fun? 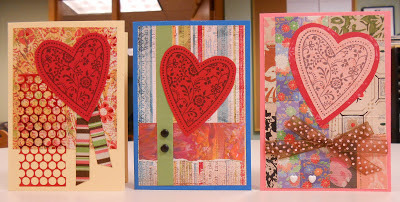 I love making Valentines (They are more fun than making the Sympathy cards from the previous post.) and if I didn't receive anything else for Valentine's Day, I would be happy with just a card. So, yesterday, February 13, I decided I had better get going. 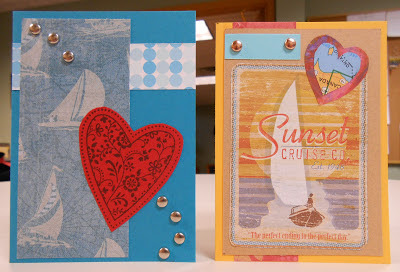 I got a lot of mileage out of the heart stamp that was part of a set from Stampin' Up. All of the paper I had on hand. It's fun going through scraps and finding things that will work. Luckily, I had bought a bunch of brads for a Christmas project, so I had plenty to choose from. However, I am going to have to work on my supply of ribbon. The bow on the one card was recycled from an old card. I'm not even sure where it came from. I think I made seven cards this year; for my folks and mother in law, for a couple of friends, and for my husband and son. Five of them I finshed up this morning before heading off to work. I even gave one to my favorite barrista. I think it made her day. So, make and give Valentines to your family and friends, then make a few extra to give to someone else in your life who you think could use a smile or a happy thought. They don't have to be romantic, just "Happy Valentine's Day to my favorite ________________!" I really enjoyed my card - thanks for making it for me!